Jens Madsen Schmidt, Anna [Bramsen] Schmidt, and daughters Inger Marie and Christine, ca. 1869-70; digital image 2010, privately held by Melanie Frick, 2018. Image courtesy of Alvie Jorgensen as printed in A Few of my Grandchildren’s Ancestors (Massachusetts: Alvie Jorgensen, 1989). 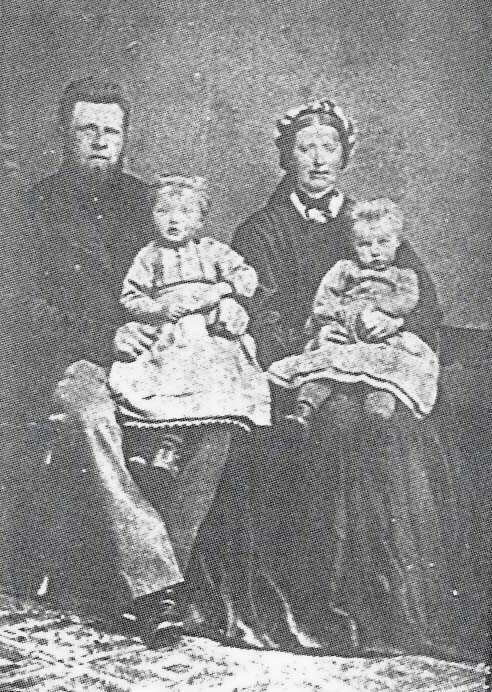 This is the oldest known photograph of the Schmidt family, believed to have been taken shortly before they departed Denmark or soon after their arrival in America. Dated circa 1869-70, it is quite possibly a carte de visite, a small card-mounted photograph popular before the larger cabinet card format became more common in the 1880s.4 The family may have wanted to share copies with their family members at home; while Anna’s parents would later follow them to Dakota Territory, Jens’s parents would not. In the photograph, Jens and Anna sit side by side in a carpeted studio, their daughters perched on their laps. Jens is heavily bearded, although his upper lip is clean-shaven. His hair is brushed back from his forehead and he wears loose trousers in a lighter color than his jacket, a similarly dark shirt buttoned underneath. Anna’s hair has a center part and is pulled back, although it seems that it may be looped over her ears. Her headwear looks vaguely medieval in appearance, something like a circular roll with a scarf at the back, although its true style is unclear as well. Additionally, few details can be distinguished of her dress, which is obscured by the child on her lap. The silhouette of the full sleeves gives the suggestion of Bishop sleeves, which would have been gathered at the cuff.5 There appears to be some detail at the neckline of the dress—perhaps a white collar with a bow tied above—and the skirt is long and full. Her attire, with the exception of her headwear, appears relatively modern and less like one tends to think of as traditional Danish folk attire. Fair-haired Inger Marie and Christine appear to wear tot-sized versions of their mother’s overall style of dress. The scalloped hem of a petticoat peeks out from under Inger Marie’s skirt; Christine’s petticoat has a straight hem. Both wear stockings and shoes. It is possible that their dresses are made of matching fabric; less than thirteen months apart in age, the girls could almost appear to be twins. This photograph appears in a spiral-bound volume entitled A Few of My Grandchildren’s Ancestors, researched and compiled by late Schmidt descendant Alvie Jorgensen nearly thirty years ago, as well as in the Yankton County Historical Society’s 1987 publication History of Yankton County, South Dakota.6 It would be exciting to view a high resolution scan of the image to observe more details and, perhaps, even learn the exact location that it was taken. 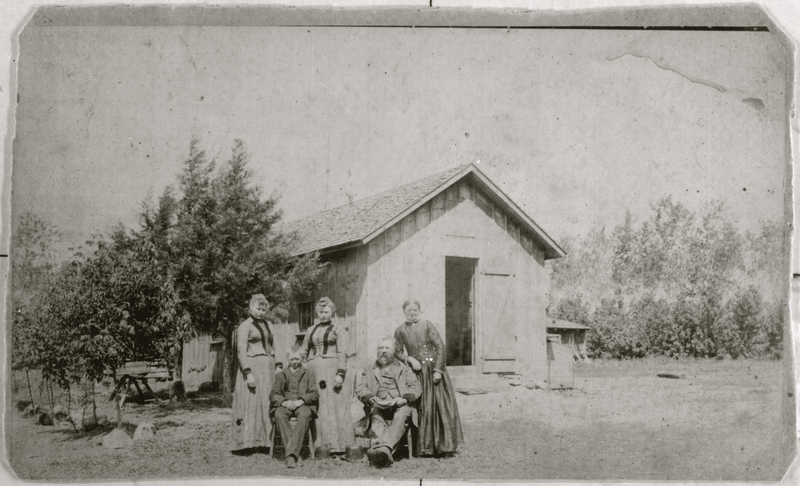 The next known photograph of the Schmidt family was taken nearly twenty years later at their homestead in what is today Bon Homme County, South Dakota. Although they were by that time young women, Inger Marie and Christine wore matching dresses. This entry was posted in Photograph Analysis and tagged 1870s, antique photograph, Bramsen, carte de visite, Denmark, family history, genealogy, Schmidt, Smith, vintage photograph on November 27, 2018 by Melanie Frick. 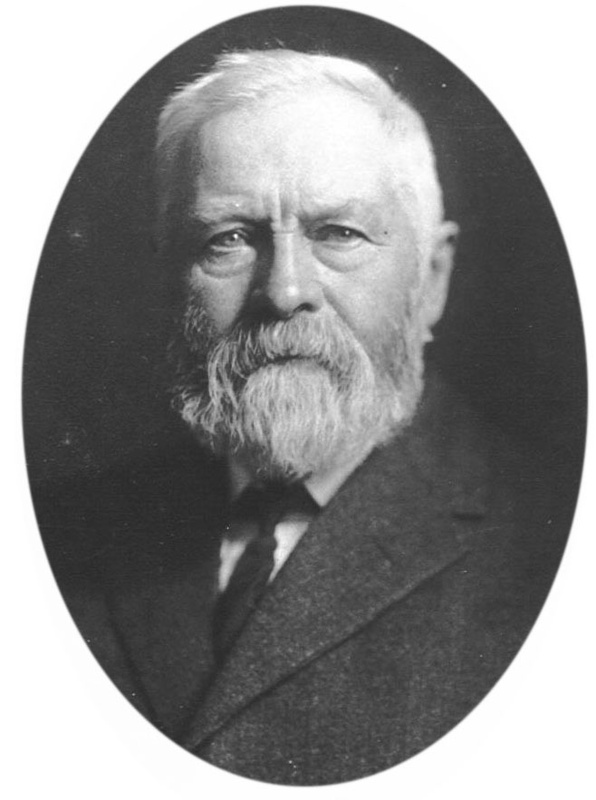 Even seventeen Dakota winters could not have prepared the Danish immigrant family of Jens Madsen and Anna (Bramsen) Schmidt for what they faced in 1888. Through the remainder of the day and into the night, the Schmidt family waited in agony, a lantern burning in their window. They had no way of knowing whether Mads had taken shelter at school, or whether he had tried, in vain, to run for home. To search for him would be futile until the storm had ceased. Schmidt Family Homestead, near Tabor, Bon Homme County, South Dakota, ca. 1888-1889; digital image 2013, privately held by Melanie Frick, 2015. From left: Inger Marie “Mary,” Mads, Christine, Jens Madsen, and Anna (Bramsen) Schmidt. 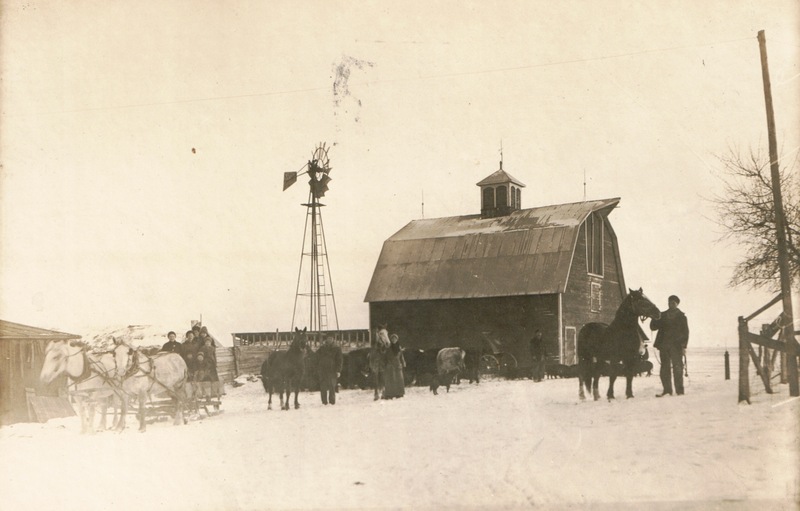 This entry was posted in Uncategorized and tagged 1880s, Children's Blizzard, Dakota Territory, family history, genealogy, Schmidt, Schoolhouse Blizzard, South Dakota on January 12, 2015 by Melanie Frick. Christine Marie [Schmidt] Nelson, Yankton County, Dakota Territory, ca. 1886-1888; digital image 2013, privately held by Melanie Frick, 2014. Christine married in the spring of 1890 at the age of twenty-one; her wedding portrait suggests that she was a bit younger when this photograph was taken.6 My guess is that she was about eighteen, give or take a year, dating this photograph circa 1886-1888. 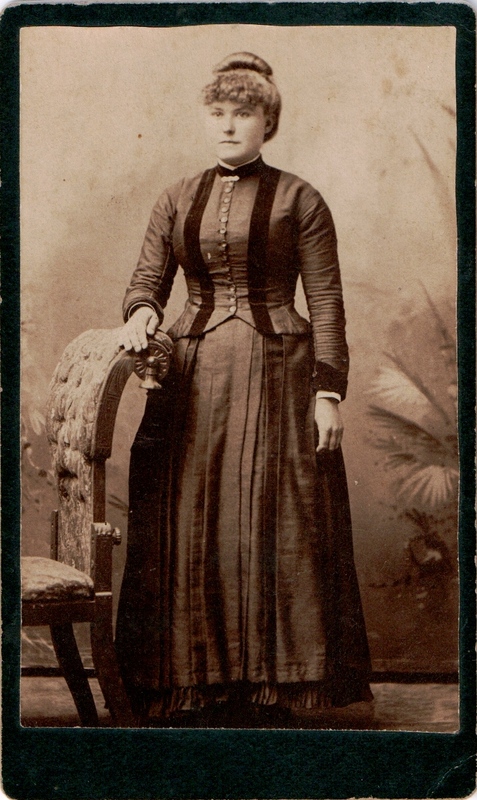 Although green cardstock, as seen on this cabinet card, technically peaked in popularity several years earlier,7 another photograph from my personal collection with cardstock of the same dark green color dates to approximately 1889. Its popularity may well have been ongoing, at least in the Midwest. Christine almost certainly sewed her dress herself, likely in the company of her mother and older sister, and she stands so as to display it to its best advantage. A subtle painted backdrop nearly touches the floor behind her as she rests her left hand on the back of an upholstered chair, gazing into the distance. In spite of her rural upbringing, Christine strikes an elegant pose, demonstrating that the latest fashions had found a place even in Dakota Territory. This entry was posted in Photograph Analysis and tagged 1880s, cabinet cards, family history, genealogy, homestead, Schmidt, South Dakota, Yankton on June 24, 2014 by Melanie Frick. As it turned out, I shouldn’t have gotten too excited. Apparently, on 8 June 1877, Luman N. Judd, Register of the Land Office at Springfield, had better things to do than to fill in the three blank lines meant to describe the home of Jens Madsen Schmidt, or the additional three blank lines meant to detail the improvements made upon his land.4 Of course, perhaps Mr. Judd isn’t to blame, and the witnesses – Peter Anderson and John Haase – were either unable to communicate these facts in English or were particularly reticent that day.5 To be fair, these men likely had crops to get back to and saw no reason to belabor the details, especially if they were equally well acquainted with Jens and knew that nothing stood in the way of his patent. Jens Madsen Schmidt, Bon Homme County, South Dakota, ca. 1900; digital image 2003, privately held by Melanie Frick, 2014. If you would like to order your ancestor’s own homestead file, I would suggest beginning with the General Land Office Records of the Bureau of Land Management, where you will be able to locate the necessary information to order the file from the National Archives. I used their online form, and found it quick and easy. Fifty dollars and a few weeks later, perhaps you will find that your ancestor’s neighbors had at least a few things to say about his living situation! This entry was posted in Land Records and tagged 1870s, Dakota Territory, Denmark, family history, genealogy, homestead, Schmidt, South Dakota on March 19, 2014 by Melanie Frick. 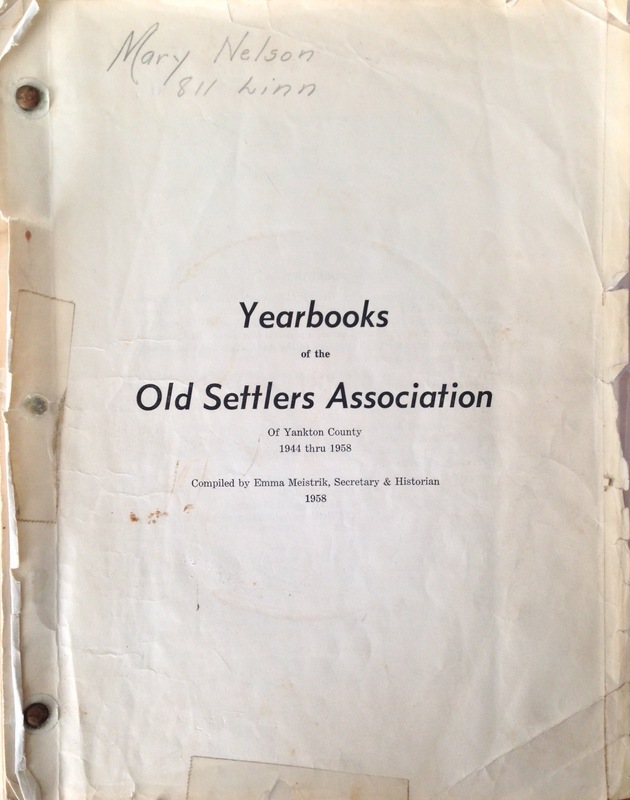 Yearbooks of the Old Settlers Association of Yankton County, 1944-1958 (Yankton, South Dakota: Old Settlers Association of Yankton County, 1958); private collection of Melanie Frick. My copy, once in the possession of an aunt, was not bound professionally, and I’m unsure whether all of the yearbooks are included. However, the stories within are rich with detail. Many of the settlers recount their experiences as immigrants, the establishment of their homesteads, and their survival of the deadly blizzard of 1888, as did Christine (Schmidt) Nelson of Yankton County, South Dakota. This entry was posted in Uncategorized and tagged family history, genealogy, homestead, Nelson, Schmidt, South Dakota, Yankton on January 27, 2014 by Melanie Frick. How did your ancestors celebrate Thanksgiving? As the cooking commences, I can’t help but wonder when Thanksgiving truly became a tradition among the different branches of my family tree, and how the celebrations might have varied. Fred and Christine (Schmidt) Nelson Family Farm, Yankton County, South Dakota, ca. 1911-1917; digital image 2013, privately held by [personal information withheld]. Her guest list indicates that they had quite a crowd for dinner. By 1908, the Nelson family numbered ten,2 so with the addition of John Schneider and Andrew and Inger Marie “Mary” (Schmidt) Schmidt, who came with their three young children,3 the number at the table was brought to sixteen. Turkey Valley School, date unknown, Turkey Valley, Yankton County, South Dakota; digital image 2010, privately held by [personal information withheld]. With these overshoes, Andrea would have been prepared for the blustery winter days on the eastern South Dakota prairie, and she would have stayed warm for the duration of the forty-mile journey home for the holidays. Now, if only we knew what was served for dinner! 1 Nelson, Anna. “Diary.” MS. Yankton County, South Dakota, 1908. Privately held by [personal information withheld]. 2 1910 U.S. census, Yankton County, South Dakota, population schedule, Township 93 Range 57, enumeration district (ED) 447, sheet 2-A, p. 186 (stamped), dwelling 24, family 24, Fred Nelson; digital image, Ancestry.com (http://www.ancestry.com : accessed 26 November 2013), citing National Archives microfilm publication T624, roll 1489. 3 1910 U.S. census, Yankton County, South Dakota, population schedule, Township 93 Range 57, enumeration district (ED) 447, sheet 3-A, p. 187 (stamped), dwelling 46, family 48, Andrew Schmidt; digital image, Ancestry.com (http://www.ancestry.com : accessed 26 November 2013), citing National Archives microfilm publication T624, roll 1489. 4 The Echo, Vol. 1, “Andrea Nelson,” Springfield, South Dakota, 1916; privately held by [personal information withheld]. 5 Andrea Nelson to Fred and Christine (Schimdt) Nelson, letter, detailing Thanksgiving plans, 18 November 1916; privately held by [personal information withheld]. 6 Andrea Nelson to Fred and Christine (Schmidt) Nelson, letter. This entry was posted in Uncategorized and tagged 1900s, 1910s, Nelson, Schmidt, South Dakota, Yankton on November 27, 2013 by Melanie Frick. 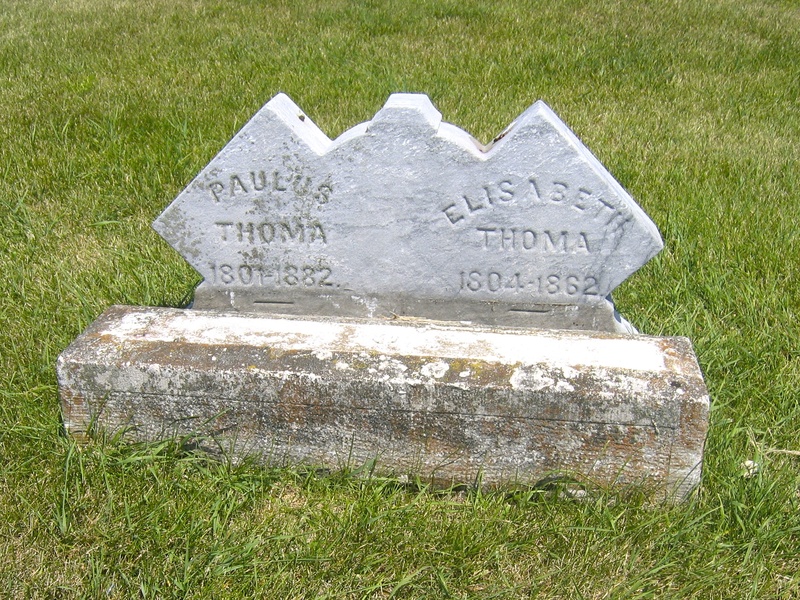 Grave of Paulus Thoma (1801-1882) and Elisabeth Thoma (1804-1862), Garnavillo City Cemetery, Garnavillo, Clayton County, Iowa; digital image 2007, privately held by Melanie Frick, 2013. The mid-nineteenth century saw what could be considered a virtual exodus of families who left their home village in Bavaria for the farmland of northeastern Iowa. Paulus and Elisabeth (Schmidt) Thoma of Weißenstadt, Wunsiedel, Bavaria, Germany were among them. Paulus was a weaver by trade,1 and together, he and Elisabeth raised eight children: John Conrad, William Henry, Anna Rosina, Frederick, Anna Sabina, Maria Magdalena, Ursula Pauline, and Anna Margaretha. 1 “New Orleans, Passenger Lists, 1813-1945” digital images, Ancestry.com (http://www.ancestry.com : accessed 1 November 2013), manifest, Uhland, Bremen, Germany to New Orleans, arriving 18 June 1852, Paulus Thoma; citing National Archives microfilm M259, roll 36. 2 “New Orleans, Passenger Lists, 1813-1945” digital images, Ancestry.com, manifest, Uhland, Bremen, Germany to New Orleans, arriving 18 June 1852, Paulus Thoma. 3Diane Haddad, “Riverboat Migration Records,” Family Tree Magazine (http://www.familytreemagazine.com/article/Whatever-Floats-Your-Riverboat : accessed 1 November 2013). 4 “New York, Passenger Lists, 1820-1957” digital images, Ancestry.com (http://www.ancestry.com : accessed 30 October 2013), manifest, Anna Delano, Bremen, Germany to New York, arriving 23 June 1855, J.C. Thoma; citing National Archives microfilm M237, roll 153. 6 Grave of Elisabeth [Schmidt] Thoma, 1804-1862, Garnavillo City Cemetery, Garnavillo, Clayton County, Iowa; digital image 2007, privately held by Melanie Frick, 2013. 7 “Iowa, County Marriages, 1838-1934,” index, FamilySearch (https://familysearch.org : accessed 01 Nov 2013), Paulus Thoma and Mary Krueger, 1867. 8 1870 U.S. census, Clayton County, Iowa, population schedule, Garnavillo, p. 17 (penned), dwelling 116, family 114, Paul Toma; digital image, Ancestry.com (http://www.ancestry.com : accessed 23 October 2013), citing National Archives microfilm M593, roll 383. 9 1880 U.S. census, Clayton County, Iowa, population schedule, Garnavillo, Enumeration District (ED) 133, p. 362 (stamped), dwelling 207, family 218, Paul Thoma; digital image, Ancestry.com (http://www.ancestry.com : accessed 23 October 2013), citing National Archives microfilm T9, roll 333. 10 Grave of Paulus Thoma, 1801-1882, Garnavillo City Cemetery, Garnavillo, Clayton County, Iowa; digital image 2007, privately held by Melanie Frick, 2013. This entry was posted in Tombstone Tuesday and tagged 1800s, Iowa, Schmidt, Thoma on November 5, 2013 by Melanie Frick.